Kaitlyn Davis graduated from Kellogg Community College. 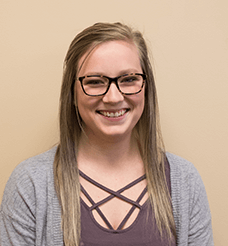 She has a special interest in applying the repeated motion strategies of the McKenzie system and helping people improve their neck and back pain. Kaitlyn also enjoys seeing the rapid benefit patients get from utilizing soft tissue techniques to address muscular pain and stiffness with both manual and instrumented techniques. She been practicing as a licensed PTA for one year. When Kaitlyn is not at work, she enjoys baking, reading, and crafting/decorating.